Getting screen output using Assembly was plenty hard enough. Getting a printing subroutine was even tougher. I don’t want to litter my programs with the same code over and over every time I want to print. So I looked for a way to set the printing commands into a useful re-usable routine. If your program prints more than one time to the screen, it becomes beneficial to have a printing subroutine. It saves memory, both source and assembled. And, with these old 48K to 128K (8 bit) machines, every byte counts. In BASIC and many other languages printing is very simple and there generally isn’t a need to make it into a subroutine unless you are doing something else along with the printing. To accomplish this milestone I had to read, a lot! I had to learn about using JSR and RTS, the assembly equivalents of GOSUB and RETURN, and how the 6502 manages the stack. Ultimately the most valuable resource were the Boot Camp articles by Tom Hudson published in A.N.A.L.O.G magazine, specially the late 1985 and early 1986 issues. JSR : Jump to SubRoutine. Causes program execution to continue at the address specified as the operand of the JSR instruction. The routine pointed to should be terminated with an RTS so the instruction following the JSR will be executed when the subroutine is complete. RTS : ReTurn from Subroutine. Causes program execution to resume at the first instruction that follows the calling JSR. This is the small program I wrote that uses a subroutine to accomplish the printing. Following the code, I detail what it does. 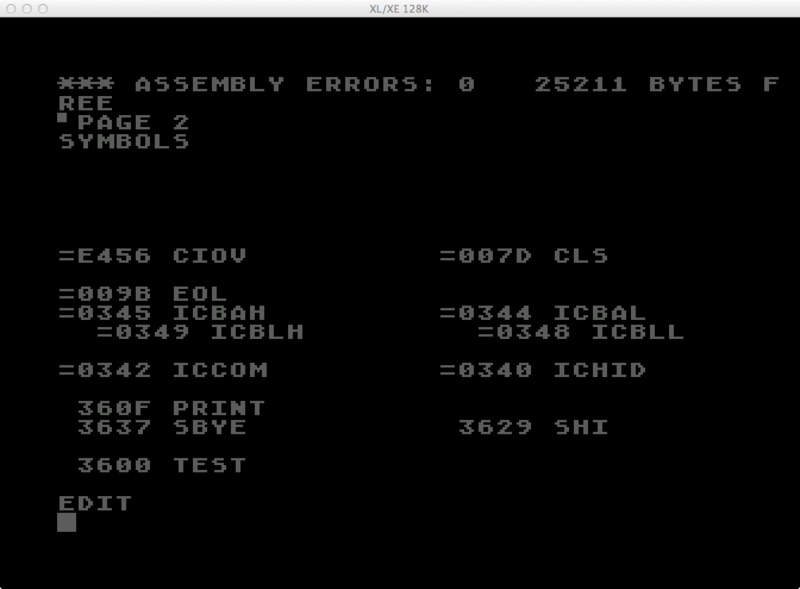 Again, I am using the OSS Mac/65 assembler. 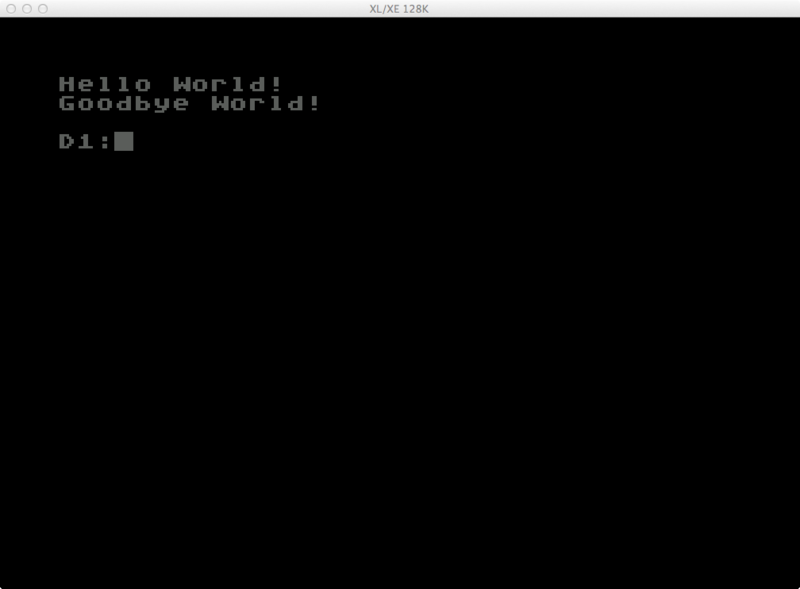 0305 ; Print clear screen followed by "Hello World!" 0335 ; Print "Goodbye World!" Lines 5 and 10: Tell Mac/65 to generate code, and define the location in memory to assemble to ($3600). Lines 70 to 76: Definitions for the CIO and IOCB addresses used by the print routine. Lines 77, 78: IOCB value definitions. Lines 80 to 82: Definitions used in the strings to be printed. Lines 310, 320: Load the Accumulator with the high byte of the string (to be printed) address. Load the Y register with the low byte of the string address. Line 330: Call the print subroutine. Lines 340, 350: Load the Accumulator with the high byte of the string (to be printed) address. Load the Y register with the low byte of the string address. Line 360: Call the print subroutine. Line 5005: Label the starting address of the print subroutine. Line 5015: Load X register with 0. Line 5020: Store the Accumulator value (which holds the strings address high byte) into the IOCB string buffer address high byte. Line 5030: Transfer the Y register (which holds the strings address low byte) to the Accumulator. Line 5040: Store the Accumulator value into the IOCB string buffer address low byte. 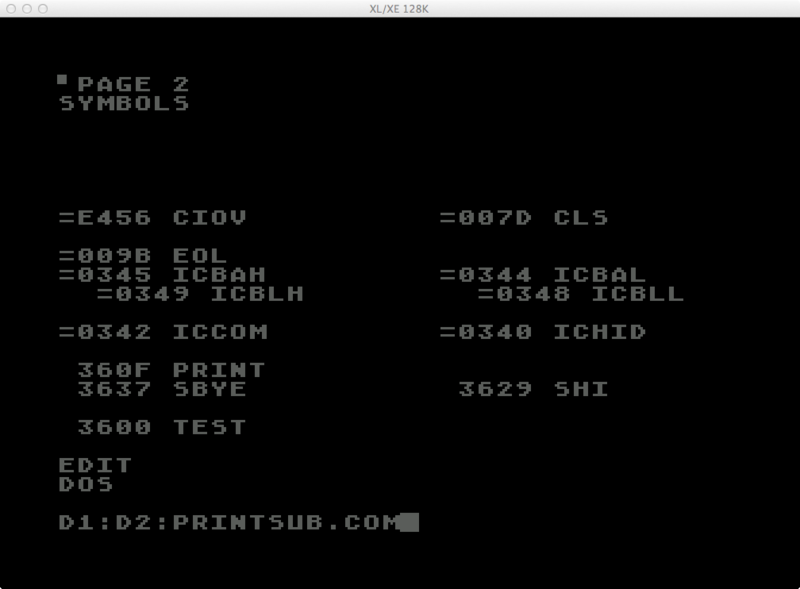 Line 5055: Load the Accumulator with 9, the IOCB print record command value. Line 5060: Store the Accumulator value into the IOCB command address. Line 5075: Load the Accumulator with value $FF (255). This will be the max size for the string to be printed. 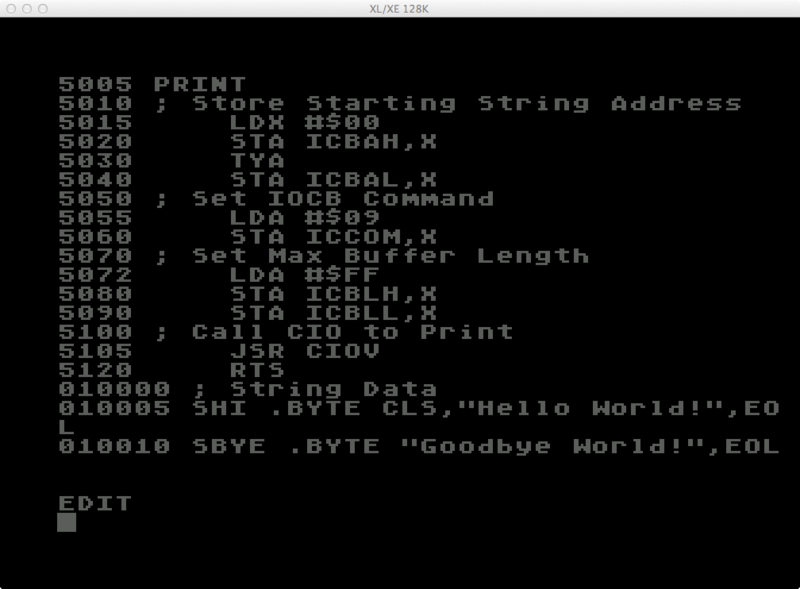 Line 5080,5090: Store the Accumulator value into the IOCB buffer length address high and low bytes. Line 5105: Call the CIO routine. It will use the IOCB information that was just setup, causing the string the be printed until either 255 characters are reached or EOL ($9B) (155) is encountered. Line 5110: Return from the print subroutine. Lines 10005, 10010: The strings to be printed, with labels, both terminated with EOL ($9B) (155). I assembled the code using “ASM ,,#D2:PRINTSUB.COM” to generate the compiled version. Look ma, no errors! With BASIC, the same outcome can be accomplished with this. It’s a lot simpler, but not nearly as efficient in machine cycles. Now to incorporate the subroutine into my preferences program!